Merlin introduces its take on the archetypical leather biker jacket: the Lichfield. The outer layer consists of beautiful bovine leather with a 1.1-1.3mm thickness which makes for a robust jacket that will age gracefully. The leather is supple, and the cut is spot on, with a slightly elongated back and pre-curved sleeves the Lichfield suits any bike, and any riding position. Pockets in the shoulders and elbows are equipped with CE Level 1 Safetech armour and there is of course a pocket for an optional back protector. Inside you'll find a removable thermal gilet with classy Marton detailing. Branding is nice and subtle throughout, adding to the already classic feel of this jacket. 1.1 - 1.3mm leather construction. Asymmetrical zip closure with quilted fold. CE level 1 Safetech shoulder and elbow armour. Pocket for optional back protector. 100g removable liner with Marton Mills panel detailing. Mesh lining for improved breathability. Welcome to Merlin Motorcycles Online, your number one resource for motorcycle parts, motorcycle clothing and motorcycle accessories. We supply OEM parts, aftermarket parts and performance parts for a wide range of motorcycle and scooter models, and stock massive selection motorbike clothing with products from all the top brands. We understand the motorcycle market and work hard to bring you the latest in design and innovation. The majority of our products are sourced directly from manufacturers in the UK and around the World meaning we can offer you competitive prices without compromising on quality. Here at Merlin Motocycles we strive to bring you the very best in both products and service, providing you with a huge selection of motorcycle and scooter parts to choose from and customer service which is second to none. MPW is the best place to shop for all your biking needs. This is found on the web pages of the couriers we use. A missing item isn't classed as missing until 14 days has passed.... This is legally when the post office regards a parcel as lost / stolen. 25% of the gross value exc. The customer must pay any and all carriage charges. This does apply for the damaged or faulty goods - we will need the original packaging back as we need to send both the item and packaging back to our suppliers. This policy does not affect your statutory rights and does not refer to faulty goods. We will endeavour to rectify any broken or faulty goods. Pictures should be supplied where necessary to enable us to resolve the issues in a quick and timely manner. 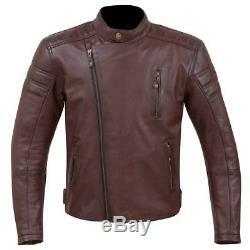 The item "Merlin Lichfield Retro Style Leather Motorcycle Motorbike Jacket Oxblood" is in sale since Tuesday, June 12, 2018. This item is in the category "Vehicle Parts & Accessories\Clothing, Helmets & Protection\Motorcycle Clothing\Jackets". The seller is "merlinmotorcyclesonline" and is located in Haverfordwest,. This item can be shipped to United Kingdom, Austria, Belgium, Bulgaria, Croatia, Cyprus, Czech republic, Denmark, Estonia, Finland, France, Germany, Greece, Hungary, Ireland, Italy, Latvia, Lithuania, Luxembourg, Malta, Netherlands, Poland, Portugal, Romania, Slovakia, Slovenia, Sweden, Australia, Canada, Brazil, Japan, New Zealand, China, Israel, Hong Kong, Norway, Indonesia, Malaysia, Mexico, Singapore, South Korea, Switzerland, Taiwan, Thailand, Chile.